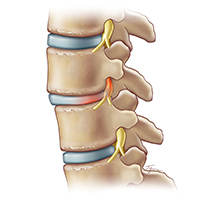 In a patient with spondylolisthesis, the disc between vertebrae may be fine, but the bony vertebrae themselves may have slipped out of position, putting pressure on the disc and a nerve. Spondylolisthesis is a condition in which one of the vertebrae (bones) in the spine slips out of the proper position onto the vertebra below it. The word spondylolisthesis is derived from the Greek words spondylo, meaning spine, and listhesis, meaning to slip. Spondylolisthesis can occur in both children and adults, for different reasons. The condition varies in severity form patient to patient, and the severity will determine the course of treatment. With spondylolisthesis, there is malalignment of the vertebra. It is not the same as a herniated disc, although the two can coexist. (Read more about herniated discs.) With spondylolisthesis, the slippage is of the bony vertebra. With a herniated or ruptured disk, it’s the soft interior of the spinal disc that “slips,” or bulges through a tear in the outer layer of the disc. When spondylolisthesis occurs in children or teens, it is usually due to a birth defect or a traumatic injury. (In fact, spondylolisthesis is the most common cause of back pain in teens.) In adults, the most common cause of spondylolisthesis is natural wear and tear due to aging and arthritis. Congenital spondylolisthesis occurs when a birth defect causes the bones of the spine to grow abnormally. When this happens, the misaligned spine puts pressure on the disc, resulting in slippage. 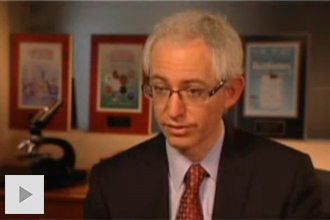 This type of spondylolisthesis occurs primarily in children and teens, especially during a growth spurt. Isthmic spondylolisthesis occurs when a condition called spondylosis puts pressure on the spine, causing the vertebrae to slip. The condition can be triggered by certain sports that put a great deal of stress on the back, such as football, gymnastics, and weight lifting. Degenerative spondylolisthesis occurs when the natural wear and tear due to aging and arthritis causes a vertebra to slip out of place. This form of spondylolisthesis usually occurs in people over 40. 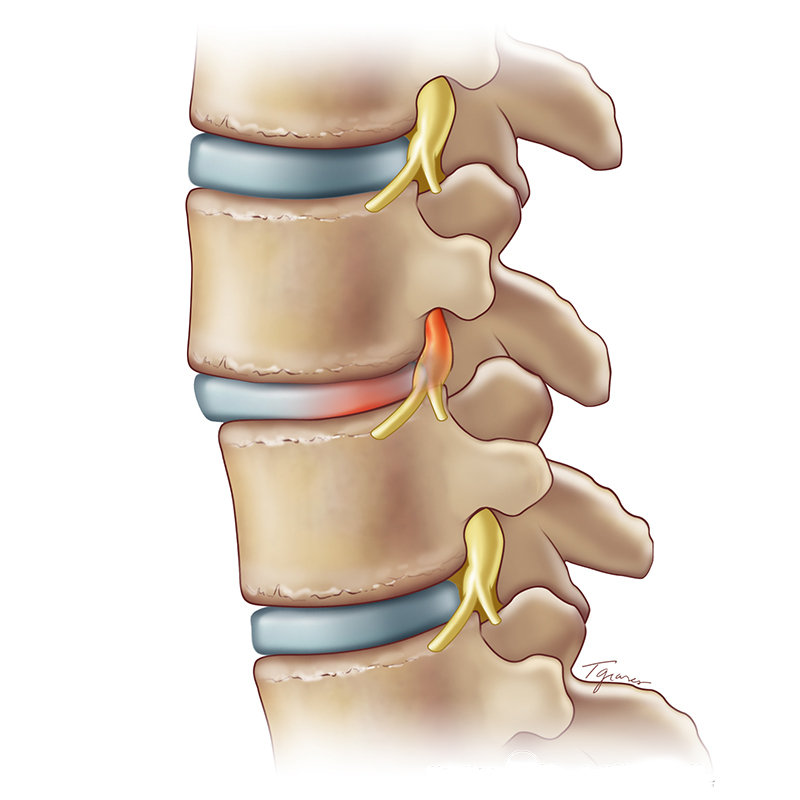 Traumatic spondylolisthesis occurs when an acute, traumatic injury such as a car accident leads to spondylolisthesis. Pathological spondylolisthesis occurs when a disease of the spine, such as tumors or infection, weaken the vertebrae, resulting in increased pressure and slippage. Spondylolisthesis should be treated at a major medical center with advanced facilities and experts experienced in treating complex spine disorders (see Doctors Who Treat Spondylolisthesis).